Who Was The Very Generous Lady Banks? • People & Genealogy, Who was? Who Was The Very Generous Lady Banks? Posted by Sharon Slater | Jul 4, 2014 | People & Genealogy, Who was? Mrs. Anne Banks, was born about 1718, she was married to Louth man Samuel Banks. 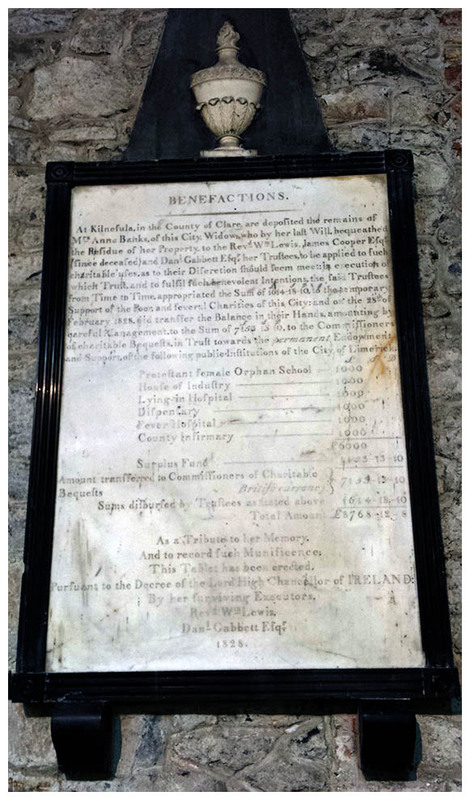 The Banks family were in Ardee, County Louth from approximately 1660. Anne Banks would make Limerick her home and would pass away a widow at the grand age of 90 in September 1807 in Charlotte’s Quay. In her will she donated intially over £8,768 to local charities this would equate to approximately €865,900 today, plus the interest on this sum for several years. The church under which she was buried in 1807 was replaced in 1815 by a new building designed by James Pain, who designed many of the buildings in Limerick. A plaque was also raised in honour of Anne Banks in St. Mary’s Cathedral in 1828. Her philanthropy to Fever Hospital, the Female Orphan Asylum, the Lying-in Hospital, the House of Industry, the county Infirmary, and the Dispensary would live on for another 30 years at least. In 1834 the estate donated £68.3.8 to the House of Industry. In 1860 there was still £30 of the interest from Anne Banks’ contribution being donated to the County Infirmary. The representatives of Mrs Banks were Governors for life at the Fever and Lock Hosptial (St. John’s). The executors of her will were James Cooper (d.1827), Reverend William Lewis (d. 1892) and Daniel Gabbett (d.1848) a who as a solicitor living at Strand House. If you have any other information on this lady and her family please contact us. Next10 Free Books on the History of Limerick Available to Download or Read Online.